A&A Machinery > Downloads > Is Your Bill of Lading Protecting You? Is Your Bill of Lading Protecting You? The article discusses the bill of lading and whether or not you are protecting your business from any issues that may arise. 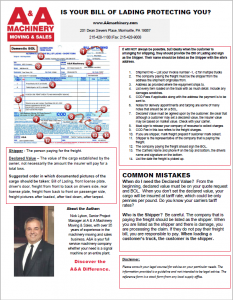 The article gives step-by-step instructions on the bill of lading process. Nick also discusses common mistakes he has seen over his 35 years in the business. LocatorOnline.com is the premier online listing service for used metalworking machinery with tens of thousands of for sale listings updated on a regular basis (Locator Online).